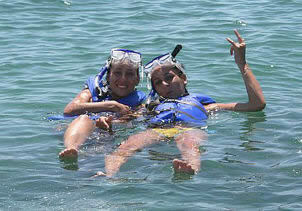 This Manuel Antonio tour is the perfect choice for those interested in getting wet and seeing nature! You will kayak for approximately 2 ½ hours (roundtrip), during which time you will paddle past islands and inlets where you can observe numerous marine aviary species and their nesting grounds. Partway through your route you will stop at a beautiful hidden bay called Bisanz Beach to rest and enjoy a refreshing snack. You can take advantage of the 30 minute stop to snorkel on the nearby reefs. You are most likely to spot parrotfish, starfish, angelfish and if you are lucky a sea turtle or two! This challenging Manuel Antonio tours allows you to discover the stunning examples of nature both above and below the ocean's surface; from pelicans to flying fish, you can see it all! Upon returning to the dock you will then head back to base camp to enjoy a little conversation over a delicious homemade meal. Kayaks are available in single or double passenger format. Kids must be at least 8 years old to paddle alone. Sea kayaking is much easier than river kayaking, and this Manuel Antonio tour does not require previous kayaking experience. Minimum Pax: 2 pax / Maximum Pax: 20 pax. What to Bring: Suntan lotion, sunglasses, camera, hat, visor and beach towel. Tour Includes: Round trip transportation from Manuel Antonio hotels, bilingual guides, beverages and dinner with a glass of wine.